In this project, Ram R & D has provided a range of services which include: product definition, mechanical design including compliance with international standards, assistance with acquiring ATEX certification, explosion protection, work in an “explosive” environment, production accompaniment (selection, control, etc.) , Thermal and dynamic analysis. 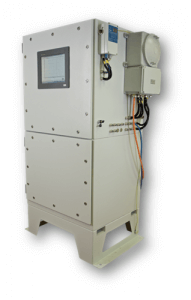 Aspect AI-60 Process Analyzer enables real-time, continues flow-through stream analysis and can provide analysis in dense and opaque materials.